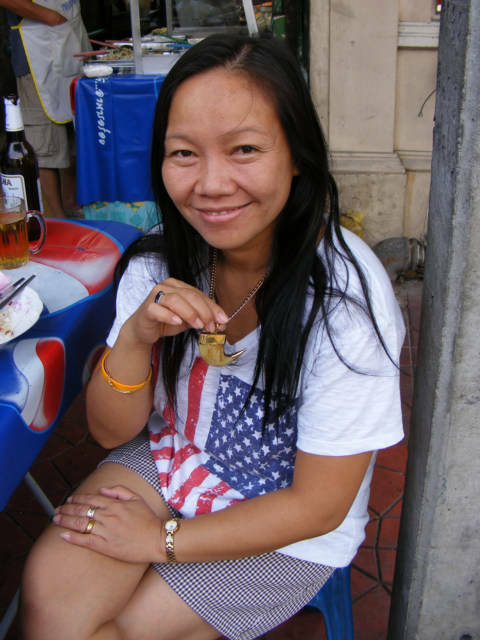 I took these two photos of a Thai Girl with an America Flag on her shirt. These two Thailand girls were enjoying the morning; I walked by and spied the American Flag, and asked if I could take a Photo. I like the American Flag; I think the colors are good. I saw about the same shirt on another girl from maybe Poland or some Eastern Europe country the other day. It is curious in Asia, I almost never see an USA citizen wearing a Flag on their shirt, unlike in the Caribbean or Mexico where they seem to propagate. I would stereotype the Americans in Asia as being normally the type that do not love the USA, and would do about anything to leave, which seems to be a good idea. I postulate that sometimes the reason the Europeans get so angry at the USA is because they are de facto Americans. They truly have no allegiance to their own country and feel like they should complain about their real country. “Yes, this would happen in Germany, however I expect more from the USA.” He said this with no bad intentions; he truly felt the USA should live up to better standards. I agree and do expect the USA to be a better place than the rest of the country. I think every person should be in love with their country, it is where they live, it is the path of least resistance. And on the other hand, I should always strive to love the country I am in because that is also good advice. Travel Agents must love people who are unhappy with their country, they know they will buy plane tickets.